I recently gave my bookcases a much-needed makeover. Ever since I had painted the room a deep blue, this faux-wood furniture had been lost in the dark hue of the walls. 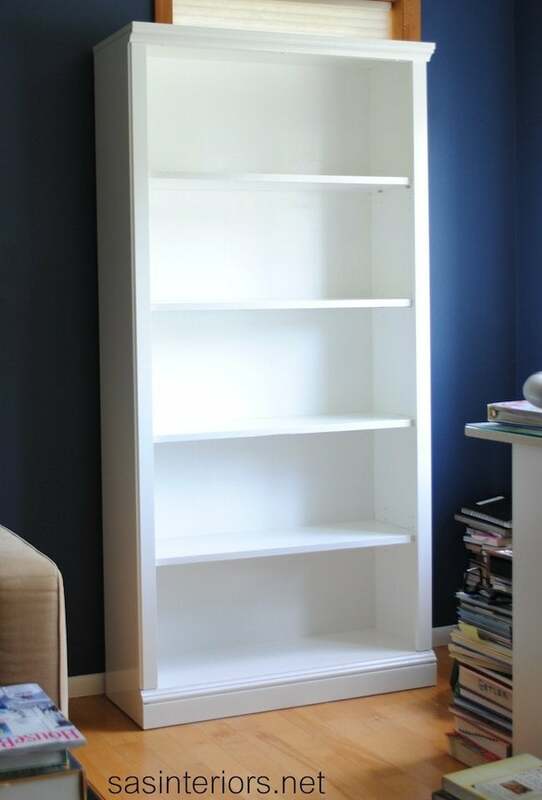 A transformation was needed, and a crisp, fresh coat of white paint on the bookcases was the perfect solution. To begin, I gave each bookcase a good sanding with my orbital sander (hands down, my favorite power tool). These bookcases are made of a particle board-like composite with a faux-wood laminate exterior. It was important NOT to sand too much since the surface is essentially paper, but it was important to get them ‘roughed-up’ enough so the paint would absorb into the surface. The next key step was to prime all the surfaces. I used Kilz Primer, which blocks, seals, and preps the surface to which the paint will adhere. Primer is important, especially when painting over laminate. Unlike wood, laminate is a smooth, non-porous material, so it really needs something to ‘grab’ onto—primer will do the trick! It’s suggested that primer takes seven days to completely dry. After sanding, priming, and making a few updates, it was time to PAINT! I used a brush for the corners and a roller for the flat surfaces. In certain areas, I used a brush first, then went over the same surface with the roller to achieve a smooth, stroke-less surface. Here’s a tip: If the surface isn’t sanded or not sanded enough, then the paint will “bubble” or spot, as shown on the right, because it’s not properly adhering. I’ll be honest, these bookcases took about three or four coats before I felt they were fully covered. And even after they were dry to the surface, I didn’t put anything on the shelves for at least a week. 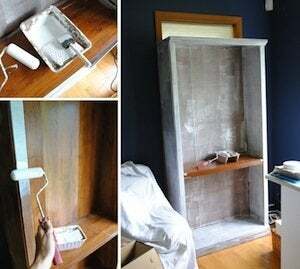 Paint takes about 30 days to fully cure and since heavy books and accessories would be sitting on the bookcases, I didn’t want to risk the paint job being ruined or beginning to peel! So refreshing! Now it’s time to add the books and accessories. Painting laminate wasn’t difficult, but I did find it more time-consuming than painting wood. To sum it up, the most important steps are to sand and prime all the surfaces before painting. 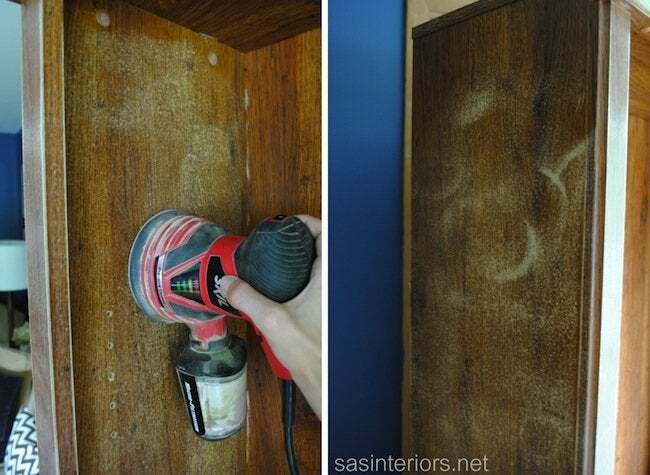 If you were to skip those two steps, your paint would have nothing to adhere to and would most likely peel right off. Going into this project, I wasn’t sure if the paint would even stay on such a smooth, but thanks to the correct preparation, I was thrilled with the outcome. Jenna Burger, the creative force behind SAS Interiors, is both a home blogger and a professional interior designer, not to mention a wife and mother. She has been passionate about interiors from an early age, though got her start in the field through architecture. After graduation, she switched gears and her dream of becoming an interior designer finally became a reality. With easy to follow tutorials, unique do-it-yourself inspiration, and an undeniable passion for the subject, Jenna Burger is a design name we aren’t likely to forget.